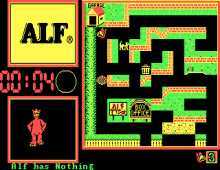 One of the better movie-based games from Box Office, Alf was a budget release game based on the popular 80's television show of the same name. As Alf the good-hearted alien, your goal is to around the neighborhood collecting pizzas while avoiding cats and the man of the household. Not unlike Pac-Man, except there is a lot more to do in each maze. For instance, in some levels you have to find parts to your spacecraft, and most levels are quite large, spanning 2 or even 3 screens. The game is quite challenging, as the cats are very nimble, forcing you to chase them around the screen before they can be caught.